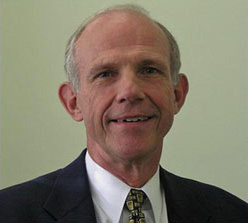 Scott joined our firm in 1991 as a partner and retired from the partnership and the practice of law in 2005. Scott was called to the Ontario Bar in 1968, and until his retirement practiced in the areas of: business law, real property law, estate planning and administration. We are pleased that many of Scott's clients have remained clients of the firm. In addition to a busy practice, for a number of years Scott was the managing partner of our firm where he oversaw all of the day-to-day management issues, to the relief of his partners. In 1995 and again in 2005, Scott donned a yellow hard had and became the firm's project manager for the extensive renovations and additions to our space that we undertook to support our growing firm. We are proud of our well-designed and tastefully-decorated offices and continue to be thankful to Scott for all his efforts. All who know Scott know that he is an active and talented golfer. He enjoys his games of golf at Westmount, and continues to hit his drives long and straight. Scott and his wife, Jane, relish their time in Mexico during the winter months, and their cottage in the summer. Peter practiced law from his call to the Ontario Bar in 1963 until his retirement from the practice and our firm in 2006. But most importantly during this time period, Peter was the founder of our firm in 1981. During his long career, Peter was appointed Queen's Counsel in 1975 and was certified and re-certified by the Law Society as a specialist in civil litigation. Peter had a very diversified civil litigation practice including: insurance litigation, personal injury, product liability, professional negligence, medical malpractice, commercial and estate litigation. As the founder of our firm and as a well-respected litigator, Peter shared his knowledge and skills with our partners who continue to practice in the field of civil litigation. Today, Giffen LLP is pleased to represent many of Peter's former clients. Peter is enjoying his well-earned retirement. He and his wife, Kathryn, have taken many extensive trips and continue to enjoy their country home in Eden Mills, Ontario. We thank Peter for founding our firm and the high bar that he has set for all of us at the firm which bears his name.